Durable material: Our 3 pcs outdoor patio chair lounge is made of super high quality wicker rattan and fabric cloth, very durable for your daily relax and rest. 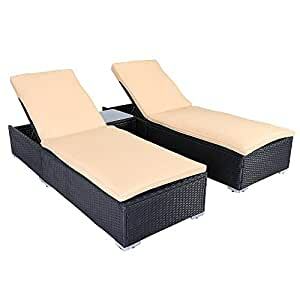 Elegant design: This patio lounge chair set is designed with two chair lounges and one table, white fabric cushion and brown wicker are greatly matched so it is such a elegant furniture for your home. Adjustable back: The chair lounge back is adjustable, you can adjust the back support bar to fix it in a comfortable position and the support is a KD steel bar, so it is super stable and sturdy. Comfortable cushions: There are two soft cushions designed for this wicker lounge, it is thick enough and you will feel super comfortable when you lay down on the chair. Extra table included: A wicker rattan table is included and it has a thick glass on the top so it will be very easy for you to clean. This is our brand new and high quality outdoor patio wicker chair lounge furniture set. It is made of super high quality wicker and fabric cushion, durable for your daily use. The chair back has a KD steel support bar so you can adjust the back height for your special needs. The whole set is elegant designed, two chair lounges and one coffee table, the chairs are matched with super comfortable thick white cushions, and the wicker table has a thick glass top for easy clean. The whole furniture is useful and durable, greatly designed for your sweet home, buy yours now!